European manufacturers will be out in full force at the upcoming Light Middle East 2018 expo in Dubai, with their latest innovative products in tow, from solar powered smart street lamps, to modular light-emitting diodes (LEDs) designed for high-rise urban greenhouses. The premier lighting exhibition in the Middle East region will feature more than 340 top companies from 25 countries when the three-day event opens for the 13th time from September 23 to 25 at the Dubai International Convention and Exhibition Centre, said the event organiser Messe Frankfurt Middle East. More than 70 of these will hail from Europe, many as standalone exhibitors, while others will be part of dedicated country pavilions from Italy, Spain, Turkey, France, the UK and Germany. The finest in European technology will be on display for thousands of regional trade buyers, architects, lighting designers, consultants, engineers, and end-users, with leading brands sharing their visions of what the regional urban lighting landscape may look like in the future, it stated. Germany-based BJB provides a prime example of Light Middle East 2018 exhibitors with an eye for a bold new future. Along with its standard product line of single row optics and cob connectors, BJB will look to make a splash with its Urban Farming LED modules, designed to help grow fruits and vegetables in city ‘farmscrapers’. The launch of the energy-efficient LED comes after the announcement that Dubai will be home to the world’s largest vertical farm. It will be welcomed by consultants working on the $40-million project, which is slated to be completed by the end of 2019. Dr Kathrin Fielitz, the business development manager for Urban Farming at BJB, pointed out that lighting was key to success of indoor farms: “For photosynthesis and therefore biomass production, plants only use certain components of the natural light spectrum – mainly red and blue,” said Fielitz. "The right spectrum and the right amount of light for the plants, as well as the efficiency of the lighting system, play a highly important role to make indoor farming a viable business," she noted. Abel is another European exhibitor at Light Middle East 2018 with its finger on the pulse of smart and energy-efficient lighting. 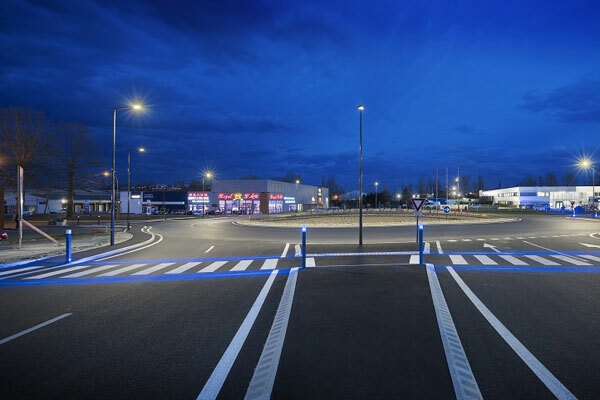 The French company manufactures products for streetlighting, including its PhotoLight solar lighting range and award-winning S-Pass safety bollard. CEO and chairman Denis Pomarel said Abel has consistently invested in solar technologies, in particular its PhotoLight luminaires that now light up Dubai’s 8.4-km Meydan cycle track. "More countries are involved in preserving the environment and are eager to install lighting solutions in areas such as roads, parking lots, parks, public squares, and residential areas without being connected to an electricity grid," observed Pomarel. “Being able to operate smart lighting by appropriate programming and communication functions also accounts for a significant part of our customers’ needs,” he added. Pomarel said the safety feature of its S-Pass bollard was key to it winning the City Mayors’ Innovation Award at the 2015-2016 Paris Fair. "With our S-Pass innovation, the idea was to give greater visibility of the pedestrian crossing to the driver. A high-visibility LED pedestrian bollard is coupled with a visual boundary created on the ground," he noted. “With blue luminous markings, both drivers’ and pedestrians’ attention is aroused, which tends to allow more respectful traffic behaviours. Greater contrasts on the road offer greater safety conditions,” he added. Meanwhile, Illuma is one of 13 British manufacturers that make up the UK Pavilion at Light Middle East 2018, and is looking to create further regional market opportunities after tasting success with projects such as the Medina Art Gallery and Saudi Electrical Company HQ in Saudi Arabia, and Dubai’s Jewel of the Creek. Morris Costello, the export manager at Illuma, said the East Midlands-based group has featured in a number of prestigious lighting projects all over the world, including Disney, Nike, BMW, Timberland, Superdry and Pandora. "We’re regular exhibitors at Light Middle East and this year is no exception,” stated Costello. "We’ve continued to exhibit at the show as it provides us a fantastic opportunity to meet architects, designers, consultants, engineers, construction companies, hospitality industry professionals, government officials and more," he noted. “This will be my first Light Middle East show and I can’t wait to get out to Dubai and take in everything the show has to offer. I’ve heard many great things about the show and it’s going to be a great opportunity for me to meet face to face with many of our existing and new international customers,” added Costello. Other prominent European exhibitors at Light Middle East 2018 include HEI Technology from Austria, LED Italy, Spain’s Faro Barcelona and Secom Iluminacion, Intra Lighting from Slovenia, and Ragni from France, said the organiser. Ahmed Pauwels, CEO of Messe Frankfurt Middle East, said the strong European presence at the expo underlines the growing demand for the latest in lighting design and technology emanating from the growing markets of the region. “In keeping with the buoyant market mood, most of the European pavilions are larger or on par with previous years, with many companies now returning to the event as standalone exhibitors. With the Middle East lighting fixtures currently on a sustained upswing, the event continues to prove that it’s the most efficient way to interact with regional buyers and gain a feel of the nuances of the regional marketplace,” he added. Light Middle East returns in 2018 with all its popular highlights including Thinklight - a three-day conference focusing on the key areas of lighting, namely architecture, interior, and landscape design.